We can help make your party something people talk about for years. Have a special party or event coming up? Why not add swing dancing and music? We can work out a special plan just for your event, whether it's small or large. It might involve us providing music and teaching a swing dance lesson to your guests. Needless to say, this was "money well spent." The dancers were everything you said they'd be and more. Our event goal was to provide a fun-filled evening for technology minded executives. Your contribution to fulfilling that vision by delivering those talented, professional, gregarious dancers - they were the life of the party - confirmed again, money well spent. A noted highlight, and there were many, was that your dancers never declined a dance as they commenced to literally interact with and engage the conferees whom had been in meetings all day. The response was awesome. The dancers truly brought a swinging good time to our event and again, thank you. 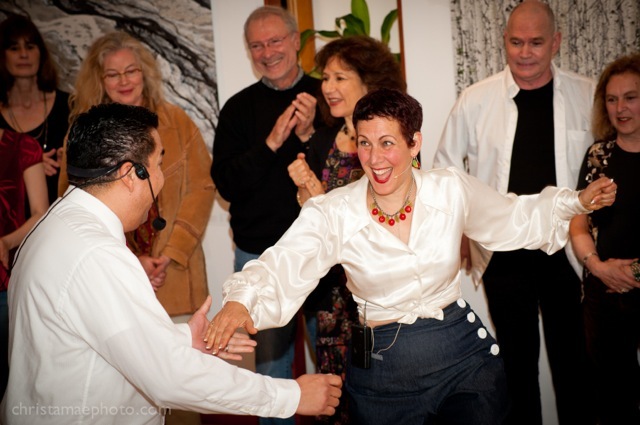 Rusty Frank and her swinging troupe were a hit at The G2 Gallery's Three Year Anniversary! With energy, vivacity, exuberance and a sparkle in her eye, Rusty took it upon herself to teach a group of over 50 persons how to put a swing in their step. If someone was shy in the beginning, they were dancing at the end because of Rusty's positive energy and moxie. It was a true pleasure to work with Rusty and I'd do it again in a heart beat. Thank you so much. Your energy is so contagious! People loved learning a few swing steps and jumped right in. We got rave reviews for the party. You made a great night go over the top. Thank you from the bottom of my heart. I want to thank you for making my mom's 75th birthday party the joy-filled event that it was. Quite frankly, when the idea was proposed to me that we have a dance instructor come to the party, I thought, "That sounds like work, not fun." Boy, was I wrong. It was not only fun, but GREAT fun. As one guest told me, it wasn't just the dancing that got people up and interested, but your infectious enthusiasm as well. My guest said further that the little switch-partners bit you had us do gave her a chance to spend a little time with people she probably wouldn't have had a chance to meet/greet at the party. I had noted that myself. In sum, you helped bring people together. I am also very appreciative that you stayed longer than you were originally asked to do. I think you noticed that we had a snafu in the sequence of events for the party, and that someone needed to "vamp" until the snafu got fixed. You were our "vamp" (as it were!) You went above and beyond the call of duty, Rusty�to the great delight of our crowd. Please also extend our deep and great thanks to Mark. People loved him! He didn't just bring dance skills to the party, but an extremely likable and caring personality. Always important, of course, but especially so when among the guests are plenty of kids and seniors. Trust you me, next time I host a dance party, I'll consider myself very lucky if I can get you and Mark to come.